kindof funny that FTC is selling toys priced as collectables, and MEGO is selling numbered collectables priced as toys. The 14" DC characters at Target are pretty cool and kid accessible. Flash and Supes look pretty good, as do the gal heroes. Plus, you get a bigger figure for 2/3 of the price. Even lower if they are still having their 3 for 2 sale. 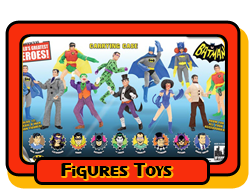 Yup, you can get 3&3/4 new Mego 14" Batgirls including ship for the same price as 1 new FTC 12" Batgirl before ship, heh!